Passengers travelling to Australia during the late 19th century formed entertainment committees to provide public amusements. 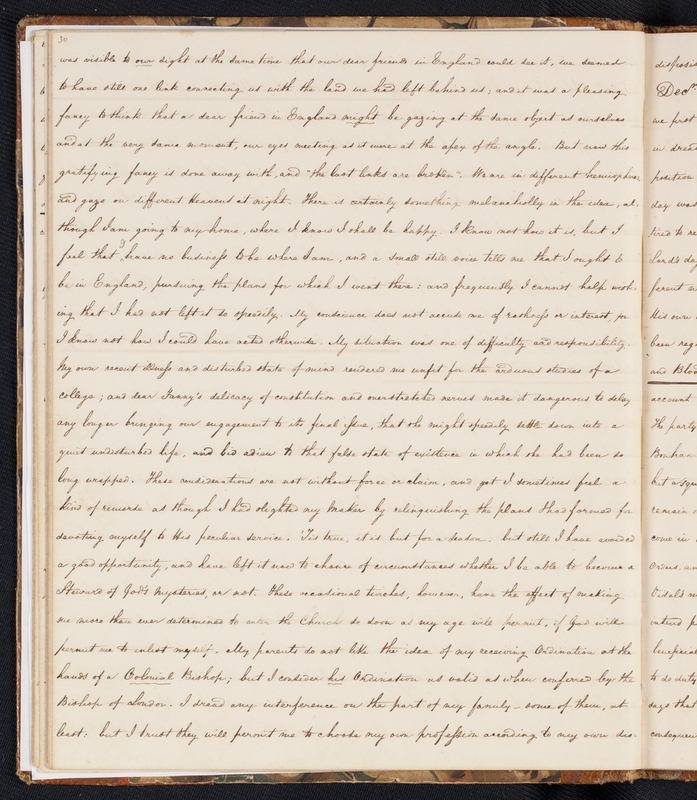 Among the more private ways for emigrants to pass the long months at sea was the writing of a journal. 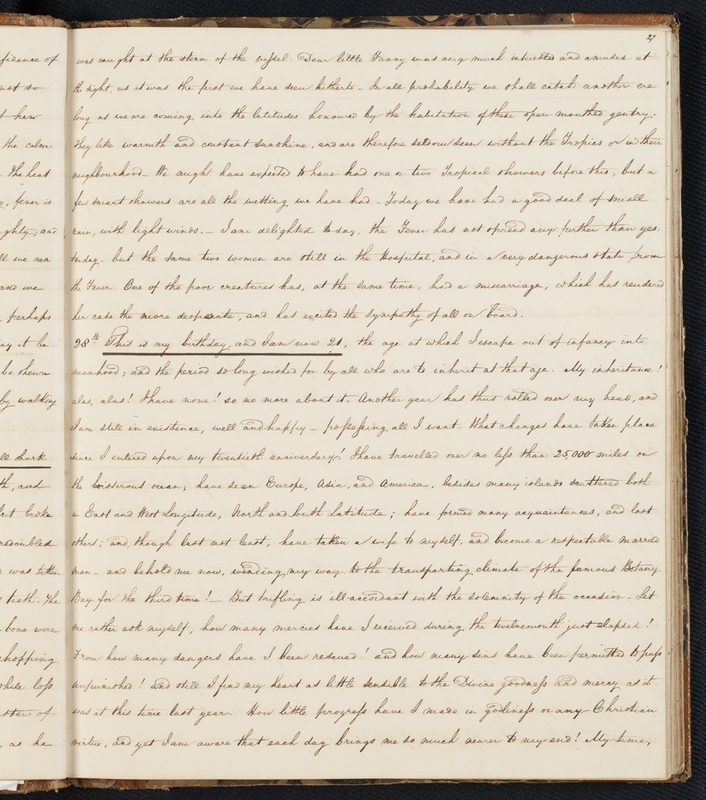 These journals provide an insight into everyday life aboard an emigrant ship, while their content and style reveal conditions experienced by different classes (and sexes) on board. 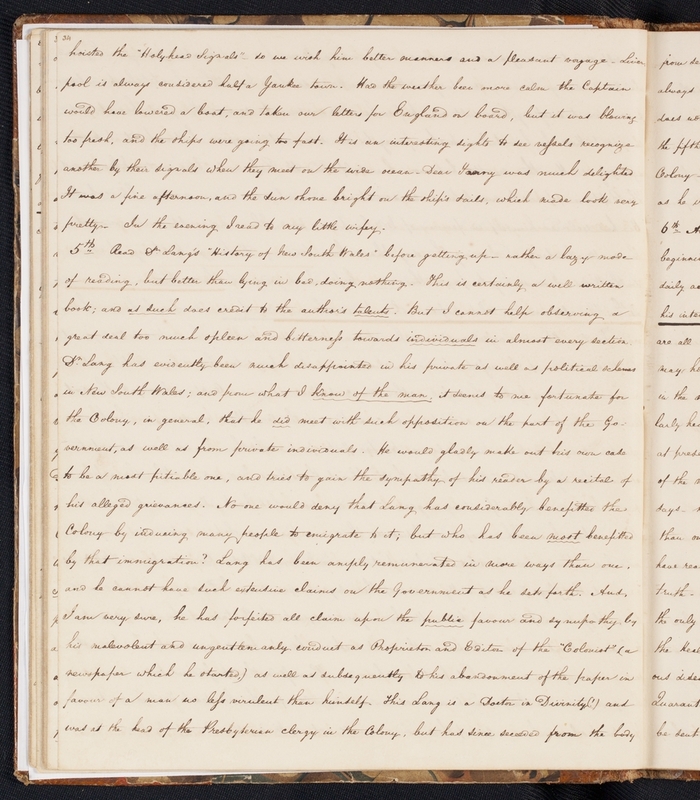 To keep a journal throughout the voyage, passengers needed a supply of stationery as well as the space and time to write. 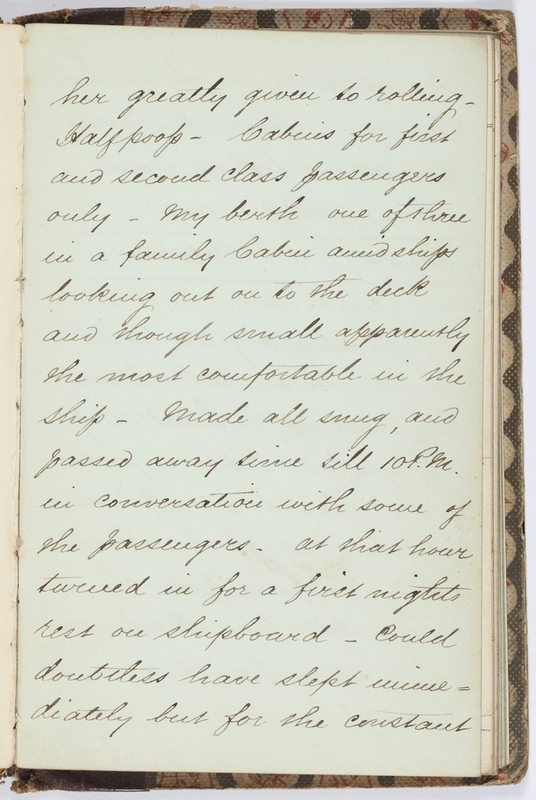 Of the shipboard diaries that survive, two thirds were kept by cabin class passengers who (with the assistance of stewards) had ample free time for journal writing while the diaries of steerage passengers were more routinely filled with details of their chores and activities. 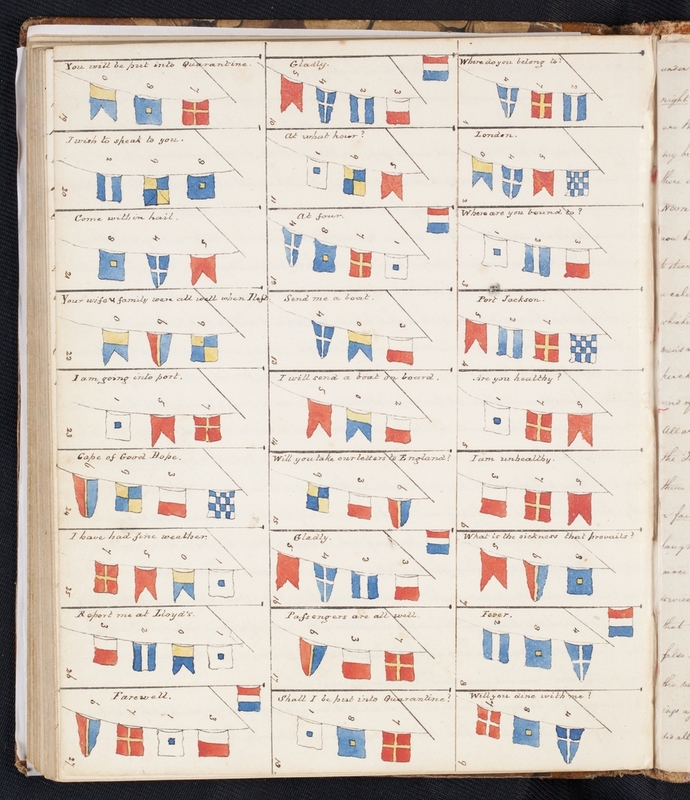 Through these journals we can discover much about the development of shipboard communities and social hierarchies. 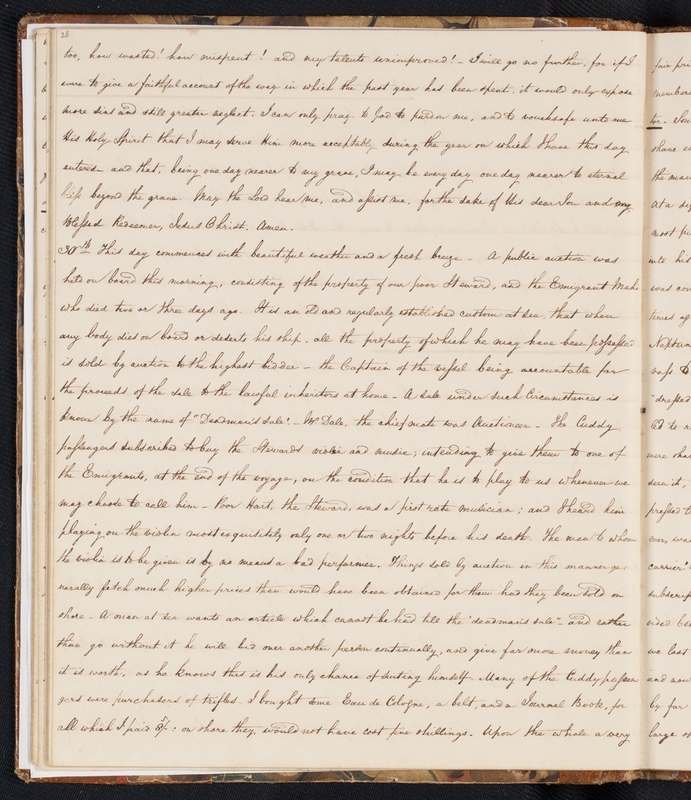 Unlike private diaries, many emigrant journals were designed for sharing with family members or friends while others are fair copies prepared with a view to publication (a bit like the modern blog). 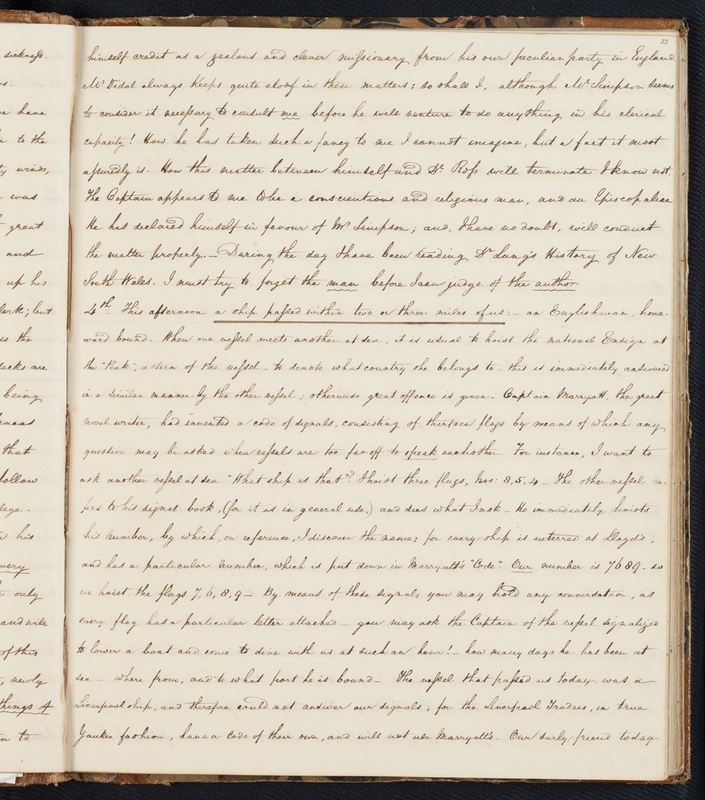 As many diarists encountered similar experiences during the voyage, 19th century emigrant journals often follow the same formula and set of themes. 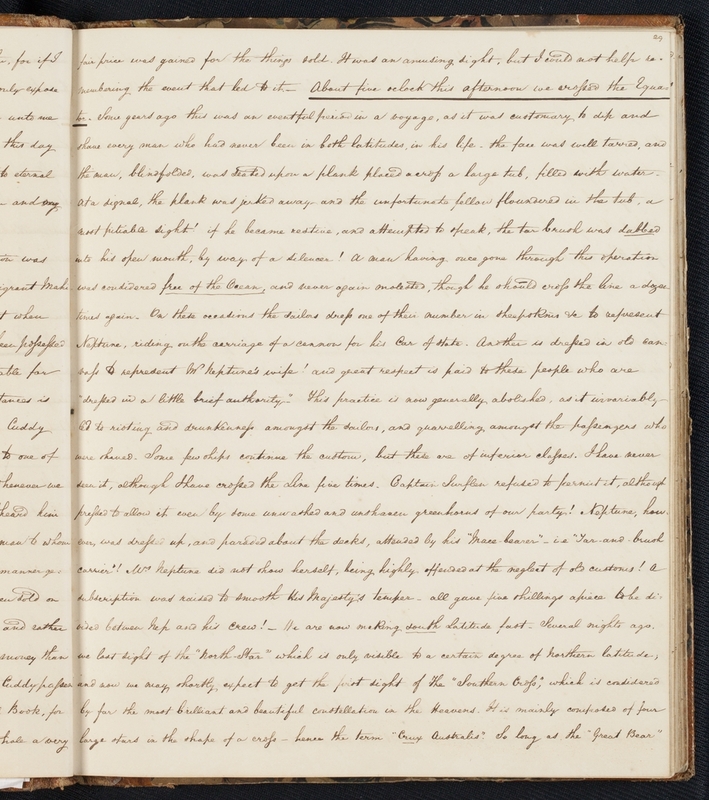 In this way, a journal could take on the tone of a travel guide for others who might make the same journey. 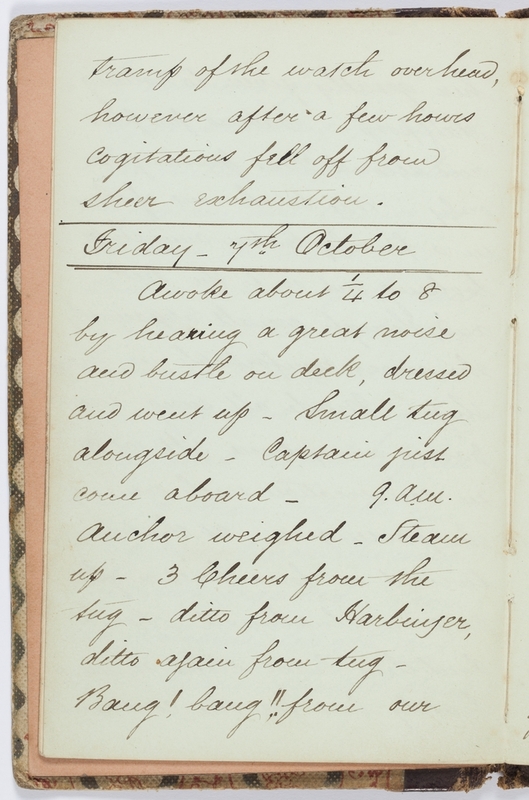 Shipboard journals vary in personality as much as their authors. 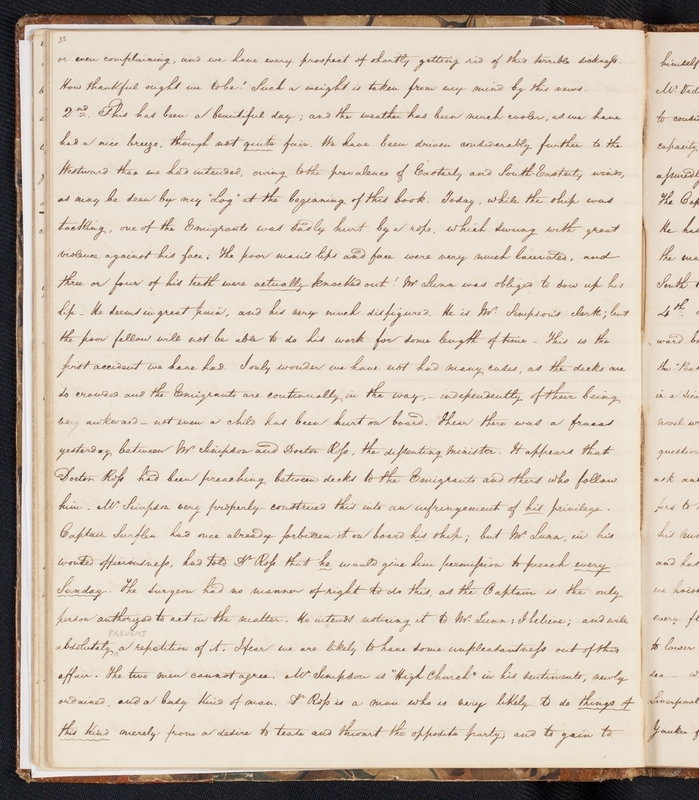 Some are dry and focus on recording the ship’s log and weather observations with simple statements of daily events; while others provide great detail about traditions and conditions on board, health, illness, births and deaths, daily entertainment, fellow passengers and emotions throughout the momentous voyage. 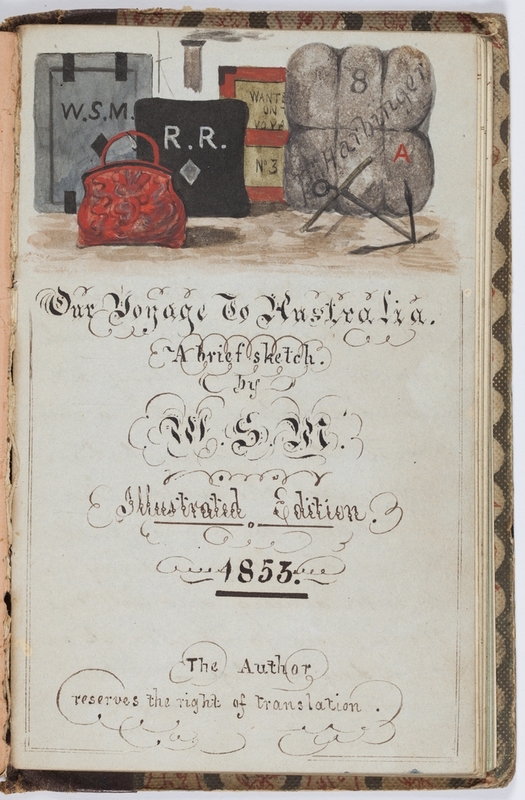 As portrayed through these journals, the voyage to Australia included common experiences and events. 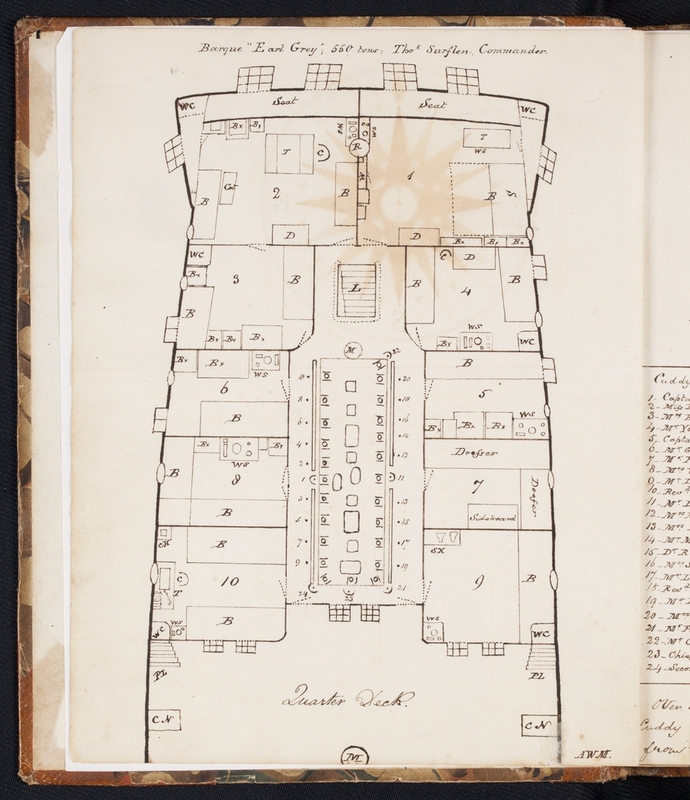 Diaries were often begun in one of the UK's large emigration depots where emigrants were inspected by the ship’s Surgeon Superintendent and organised into their messes for the voyage. 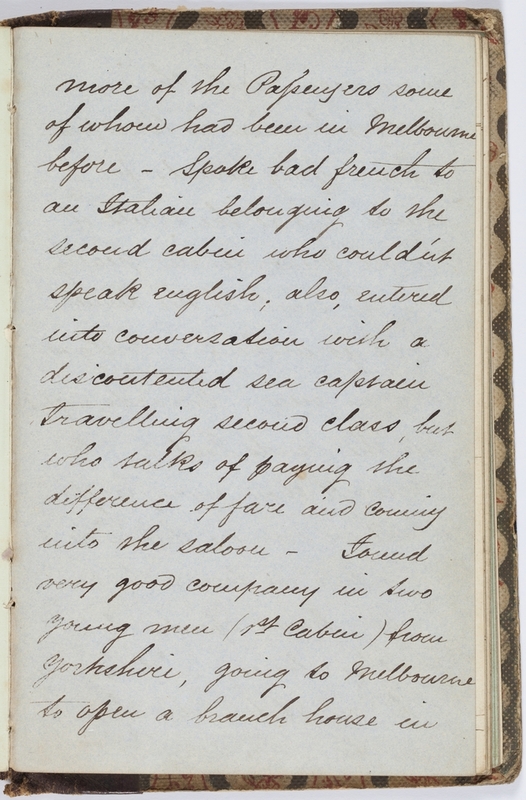 Once on board, emigrants describe seasickness, whether their own or their fellow passengers. 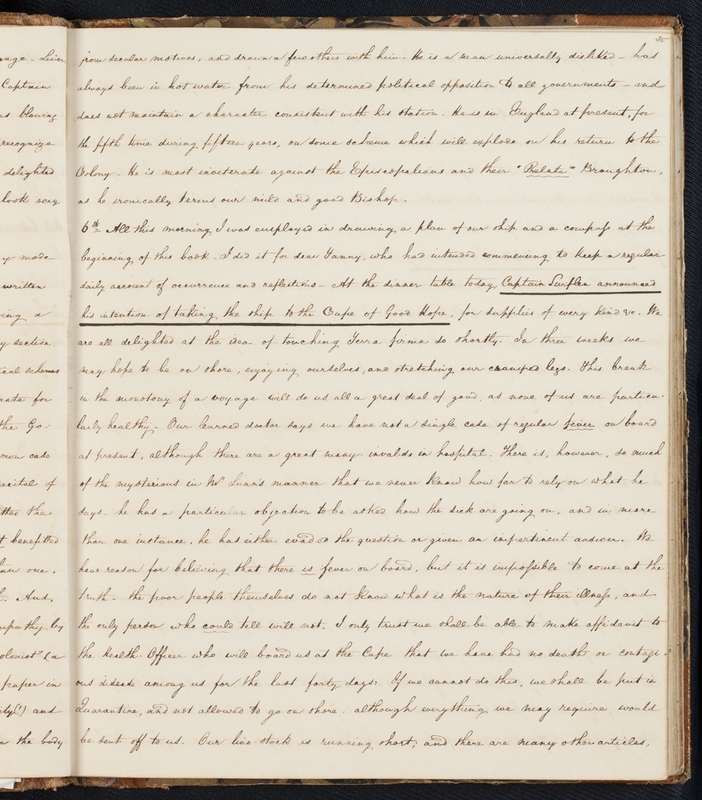 As the voyage progressed, passengers record sighting islands, phosphorus water, the heat, crossing the equator, being stuck in the doldrums and, as they head south, freezing weather and icebergs, sharks, flying fish, and birds. 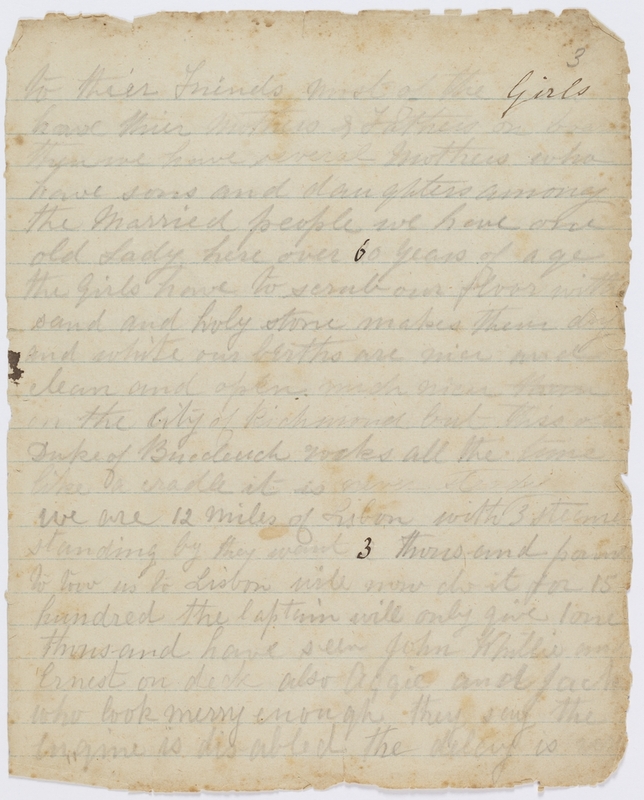 Emigrants recount concerts, dancing, religious services, shipboard newspapers, but most often they write about food. Arthur Wilcox Manning (1819-1899) left England in 1839 with his first wife, Frances Lake, for a new life in New South Wales. 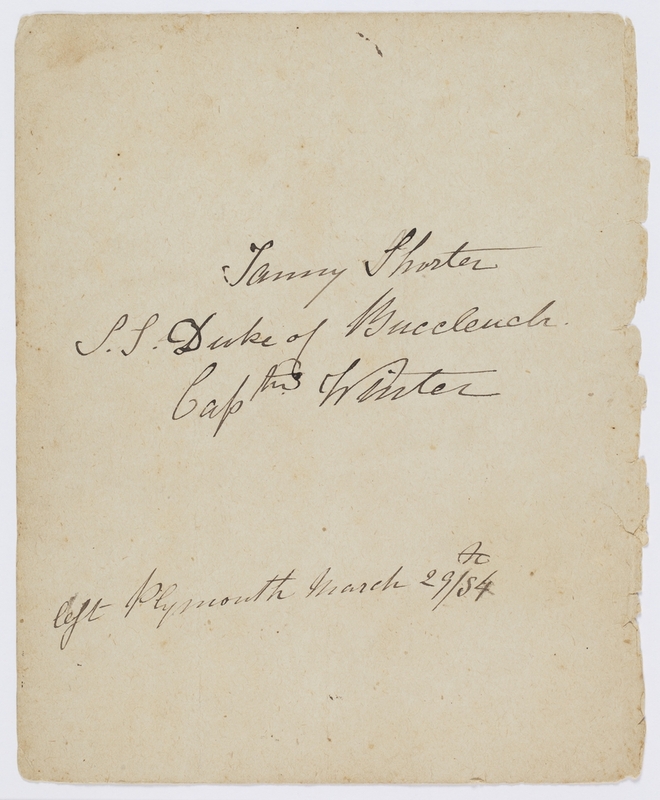 The fourth son of John Edye Manning, who had travelled to Sydney in 1829, Arthur Manning went on to have a distinguished career as a government official in New South Wales and Colonial Secretary in Queensland. 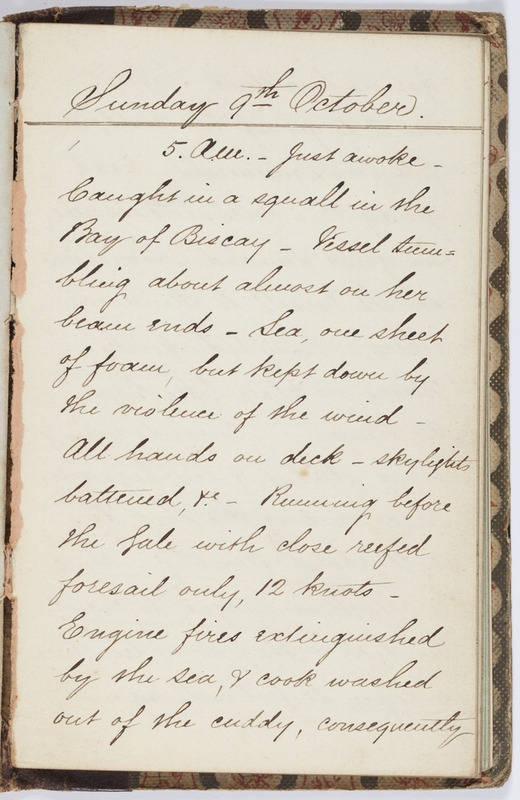 In his journal Manning records life on board the Earl Grey from the perspective of a first class passenger, distinctly aware of the frictions between the different classes of emigrants. 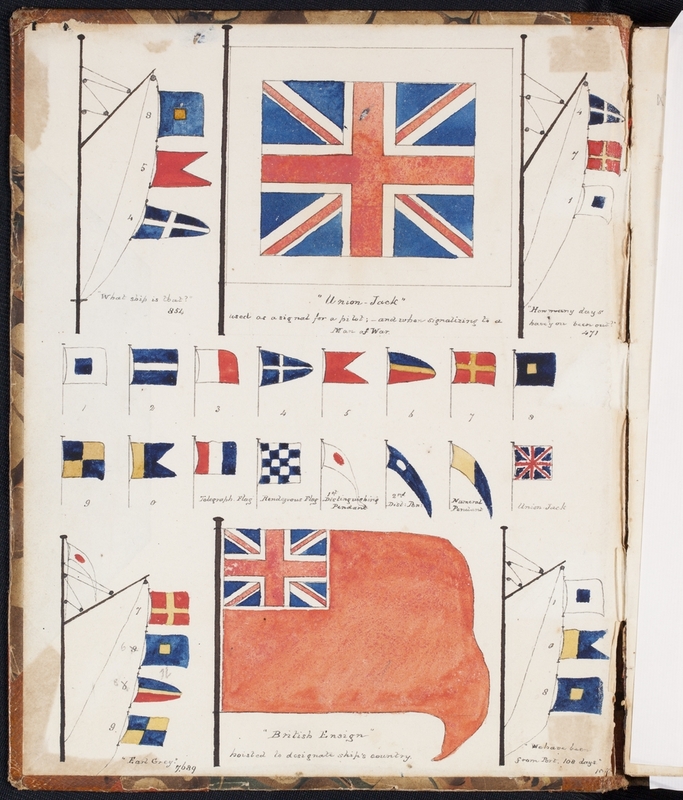 Manning's journal also includes a plan of the ship, a list of passengers and officers, a compass rose, occurrences on board, ship's log, and two pages of coloured illustrations of flags and signals. 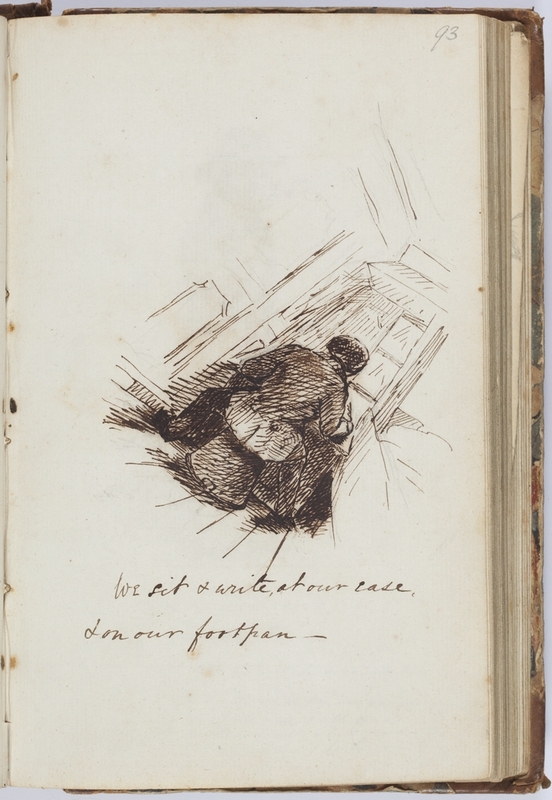 ... was caught at the stern of the vessel. 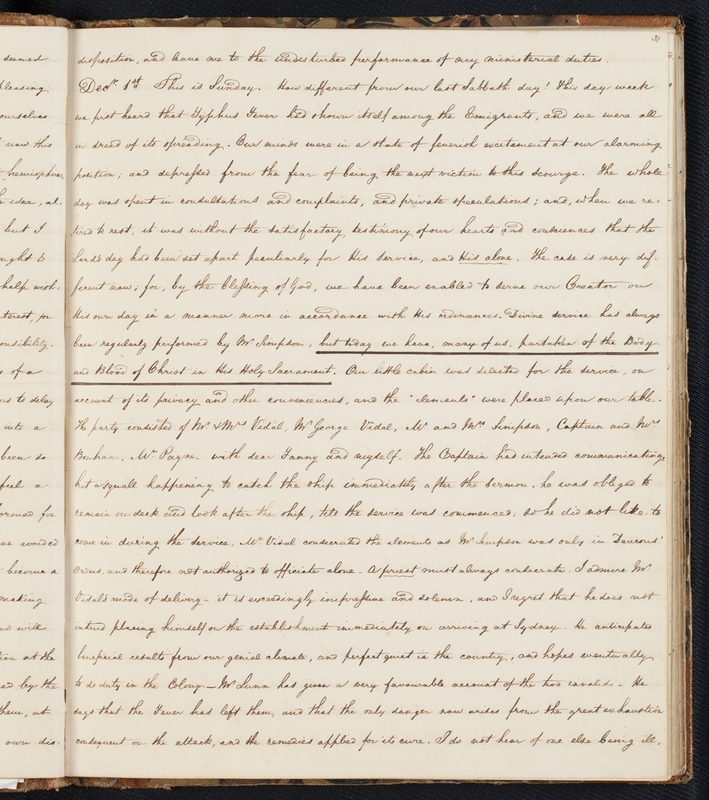 Dear little Fanny was very much interested and amused at the sight, as it was the first we have seen hitherto - in all probability we shall catch another ere long as we are coming into the latitudes honoured by the habitation of these open mouthed gentry. They like warmth and constant sunshine, and are therefore seldom seen without the Tropics or in their neighbourhood. We might have expected to have had one or two Tropical showers before this, but a few smart showers are all the wetting we have had. Today we have had a good deal of small rain, with light winds. 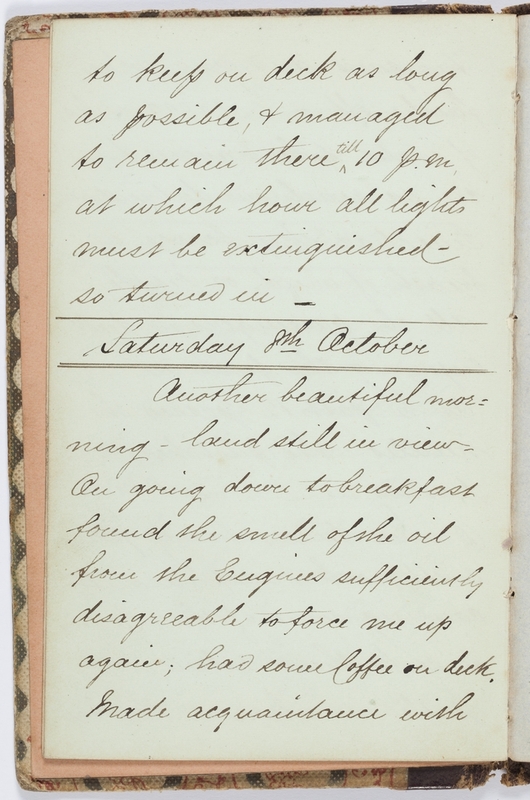 I am delighted to say, the Fever has not spread any further than yesterday, but the same two women are still in the Hospital, and in a very dangerous state from the Fever. One of the poor creatures has, at the same time, had a miscarriage, which has rendered her case the more desperate, and has excited the sympathy of all on board. or even complaining, and we have every prospect of shortly getting rid of this terrible sickness. How thankful ought we to be! Such a weight is taken from my mind by the news. hoists the “Holyhead Signals” so we wish him better manners and a pleasant voyage. Liverpool is always considered half a Yankee town. 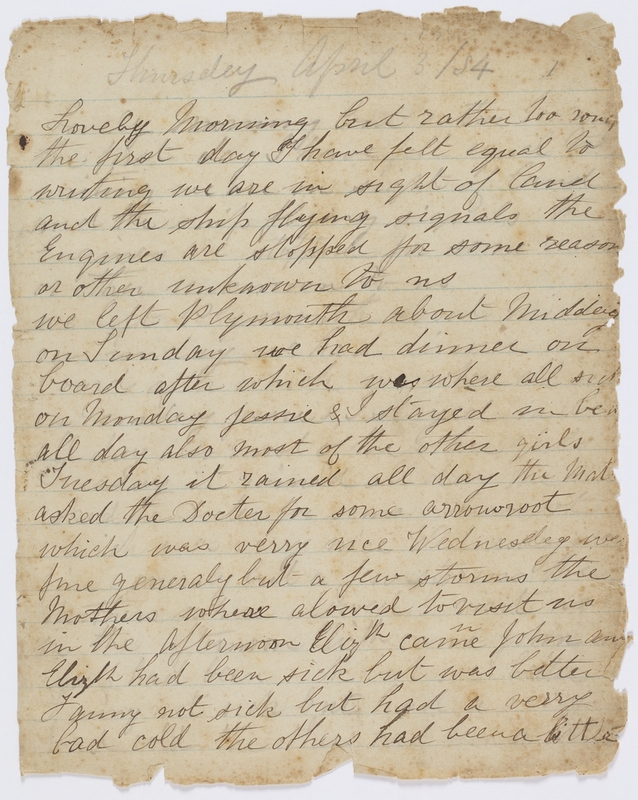 Had the weather been more calm the Captain would have lowered a boat, and taken our letter for England on board, but it was blowing too fresh, and the ships were going too fast. It is an interesting sight to see vessels recognize another by their signals when they meet on the wide ocean. Dear Fanny was much delighted. It was a fine afternoon, and the sun shone bright on the ship’s sails, which made look very pretty. In the evening I read to my little wifey. from secular motives, and drawn others with him. He is a man universally disliked - had always been in hot water from his determined political opposition to all governments - and does not maintain a character consistent with his station. He is in England at present, for the fifth time during fifteen years, on some scheme which will explode on his return to the Colony. He is most inveterate against the Episcopalians and their “Prelate” Broughton, as he ironically terms our mild and good Bishop. 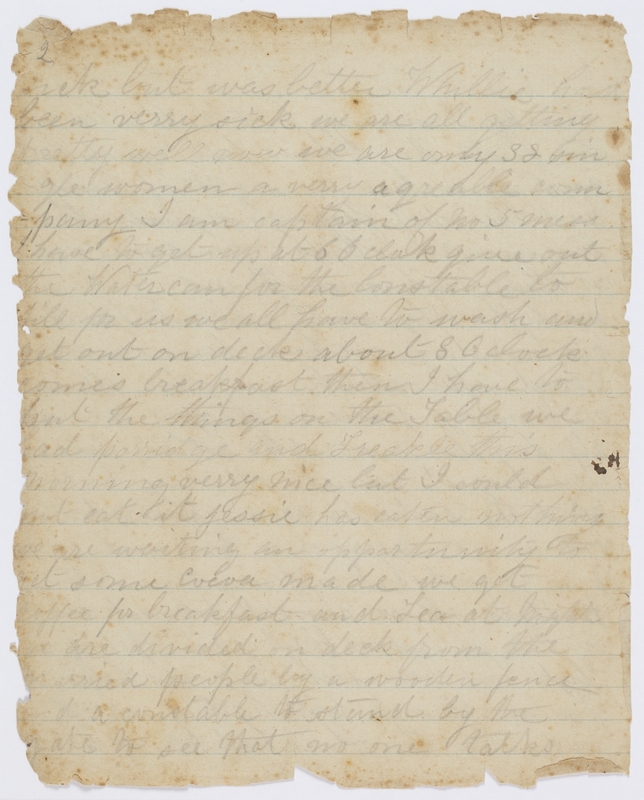 34-year-old Fanny Shorter made the voyage on the S. S. Duke of Buccleuch from Plymouth to Brisbane as an assisted immigrant in 1884. 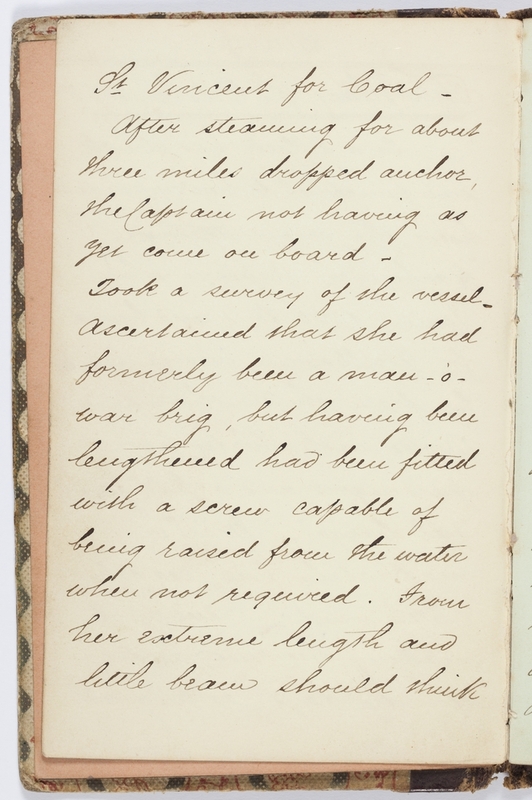 Her diary describes the life of a single female travelling from the UK to Australia on an emigrant ship during the late 19th century. 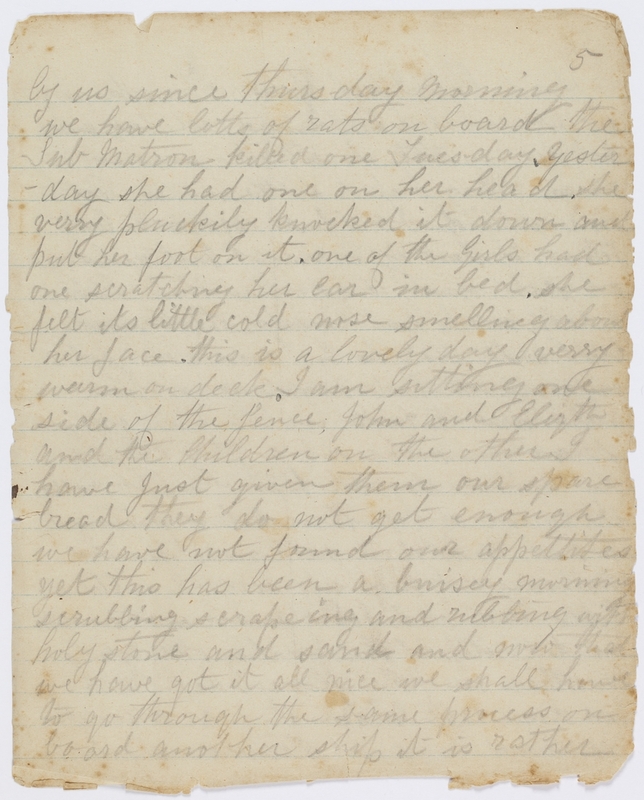 Written to ‘John’ with direction to make a copy for her Aunt Charlotte and lend it to 'Alfred' to copy for his mother, Fanny recounts her daily life on board. 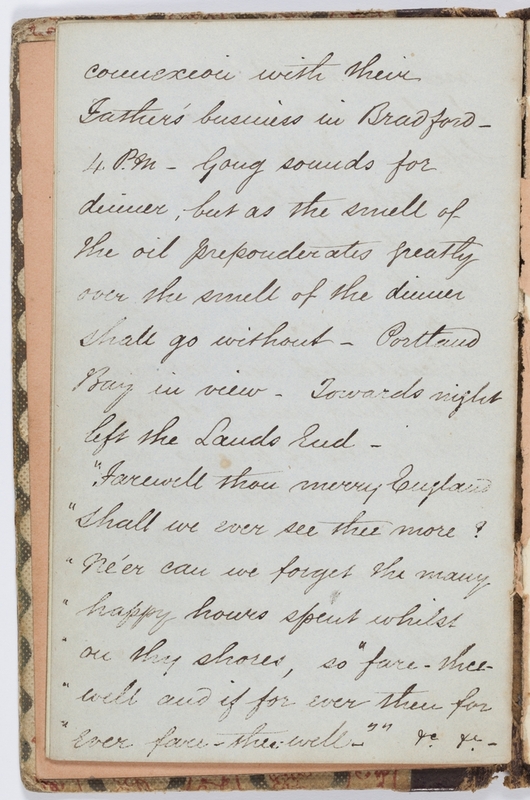 While 'one day is very much like another', her time is taken up with tasks such as cleaning, cooking, and assisting to cover library books, as well as entertainment in the form of concerts and dancing. sick but were better. Whillie had been very sick. We are all getting pretty well now. We are only 32 single women, a very agreeable company. I am captain of No. 5 mess. I have to get up at 6 o'clock, give out the watercan for the constable to fill for us. We all have to wash and get out on deck about 8 o'clock. Then comes breakfast. I have to put the things on the table. We had porridge and treacle this morning - very nice, but I could not eat it. Jessie has eaten nothing. We are waiting an opportunity to get some cocoa meade. We get coffee for breakfast and tea at night. by us since Thursday morning. We have lots of rats on board; the Sub-Matron killed one Tuesday. Yesterday she had one on her head; she very pluckily knocked it down and put her foot on it. One of the girls had one scratching her ear in bed. She felt its little cold nose smelling about her face. This is a lovely day - very warm on deck. I am sitting one side of the fence, John and Elizabeth and the children on the other. I have just given them our spare bread as they do not get enough. We have not found our appetites yet. 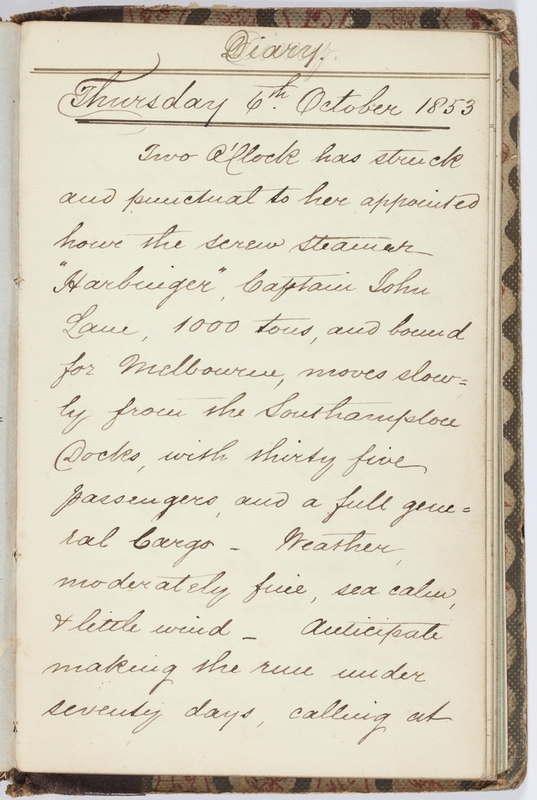 Our voyage to Australia by W. S. M.
'Our voyage to Australia: a brief sketch' by W. S. M. describes a passage on the screw steamship Harbinger, under Captain John Lane, bound for Melbourne from Southampton. 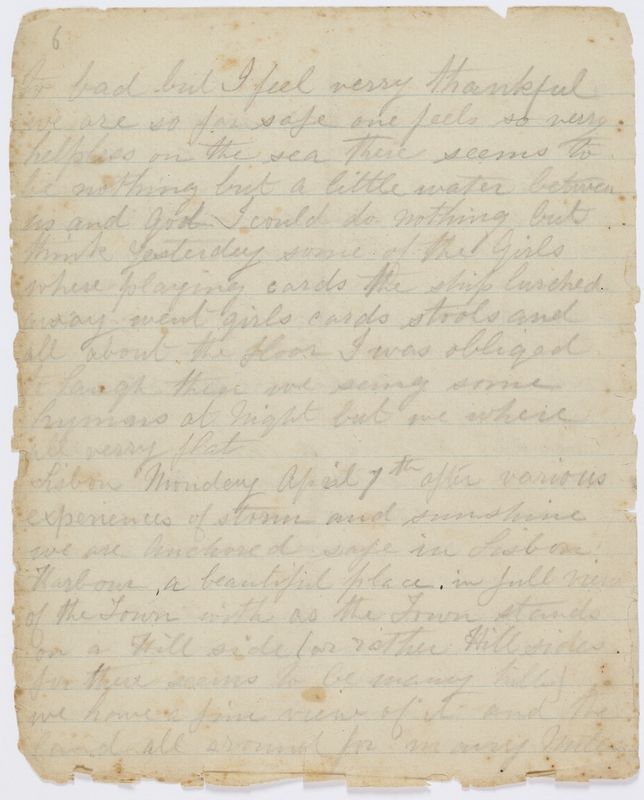 The author is most likely William Strother Medlicott, who arrived in Melbourne on the Harbinger in 1853. 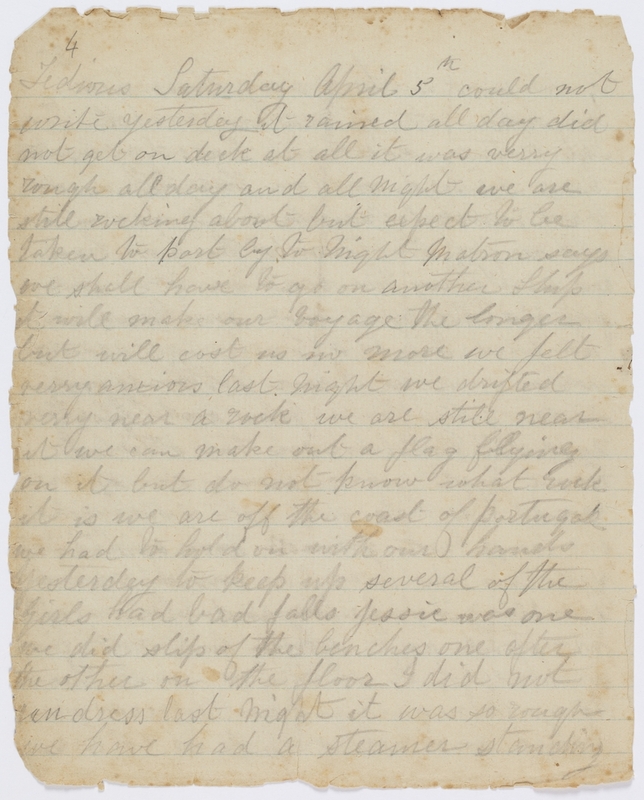 The writer enjoyed the benefit of having a berth in a family cabin with stewards in attendance. 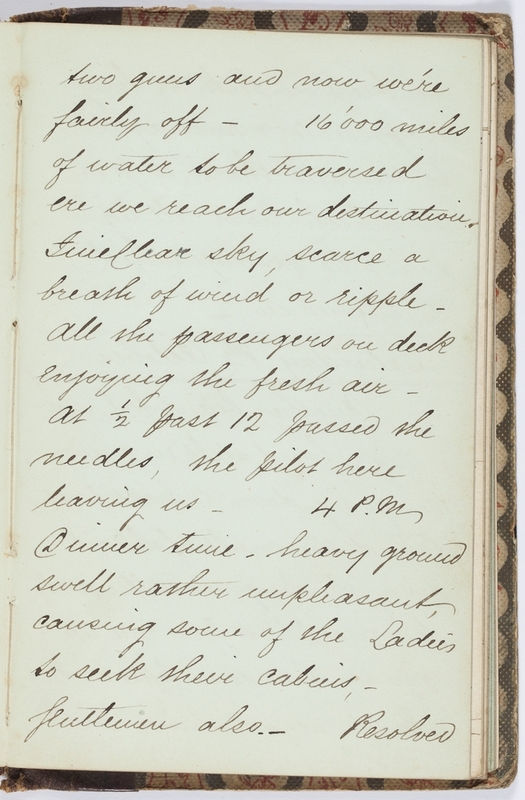 His diary records life as a cabin passenger, with days spent with time to write, pursue entertainments, and speak with fellow passengers.